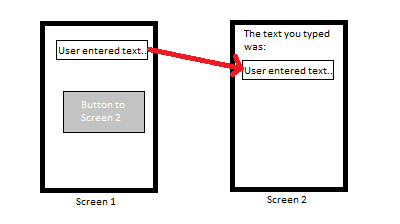 How do I make a button on Screen 1 display user-entered text on Screen 2? brings the user to screen 2 where text displays the text user-entered text. This should be simple but I don't know how to do this. you can simply set public property value of next View. where your SecondViewController Has Public Property. Forms or Native? In both you can just transfer the data between the pages with a parameter.